Reach for grill wipes instead of a bristle brush the next time you’re ready to clean the grill. 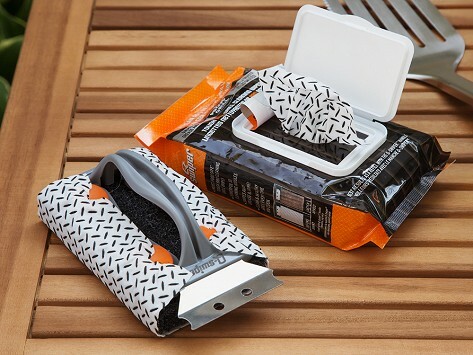 The bristle-free Q-Swiper Grill Cleaning Wipe System features a stainless steel scraper to remove burnt-on food, a flexible scrubbing pad, and tough, grease-absorbing wipes—with food-contact safe cleaning agents—to let you get between the grates for a fresh, grime-free surface every time. Dimensions: Scrubber: 7" x 3.5" x 2.5"; 25 Wipe Pack: 8" x 4" x 1.5"
Weight: Scrubber: 0.17 lb. ; 25 Wipe Pack: 0.675 lb.